Since I am wont to make blithe analogies between the performances of ritual and sport, the pre-match haka of the All Black rugby team makes a fine illustration, also revealing the enduring depth of folk culture. In its constant adaptations, both in sporting and other ceremonial versions, it’s deeply impressive. The wiki articles on the traditional and sporting versions make a useful introduction, and there are many fine YouTube clips. As a Māori ritual war cry the haka was originally performed by warriors before a battle, proclaiming their strength and prowess in order to intimidate the opposition. But haka are also performed for diverse social functions: welcoming distinguished guests, funerals, weddings, or to acknowledge great achievements, and kapa haka performance groups are common in schools. Some haka are performed by women. In 2015 hundreds of students performed a haka at the funeral of their high-school teacher in Palmerston, New Zealand. In 2016, on the 15th anniversary of 9/11, New Zealand firefighters honoured the victims with a powerful haka. The New Zealand native football team first performed a haka against Surrey (!) on a UK tour in 1888. The All Blacks have performed it since 1905. After witnessing the haka in Paris in 1925, James Joyce adapted it in Finnegan’s wake. For the 1954 version at Twickenham and evolution in the wake of TV, see here. The adaptation of the haka to the sporting event compares favourably with Chinese concert versions of ritual. However it’s done, it never descends to the kitsch of such adaptations—it’s always performed with great intensity and integrity, giving an impressive glimpse of a serious ritual world. In its practised commitment it contrasts strangely with footballers singing their national anthems—even the Brazilian team. Tupoto koe, Kangaroo! You look out, Kangaroo! Au Au Aue a! Woe woe woe to you! From the sublime to the ridiculous… Several youtube wags have suggested suitable responses from opposing teams: a burst of Riverdance by the Irish team, or (from the English) the hop-skip-hand-behind-the-back routine in Morecambe and Wise’s Bring me sunshine. The Intangible Cultural Heritage rears its ugly head again—perhaps the English team could emulate the Britannia Coconut Dancers of Bacup, a 150-year-old troupe of Lancastrian clog dancers. 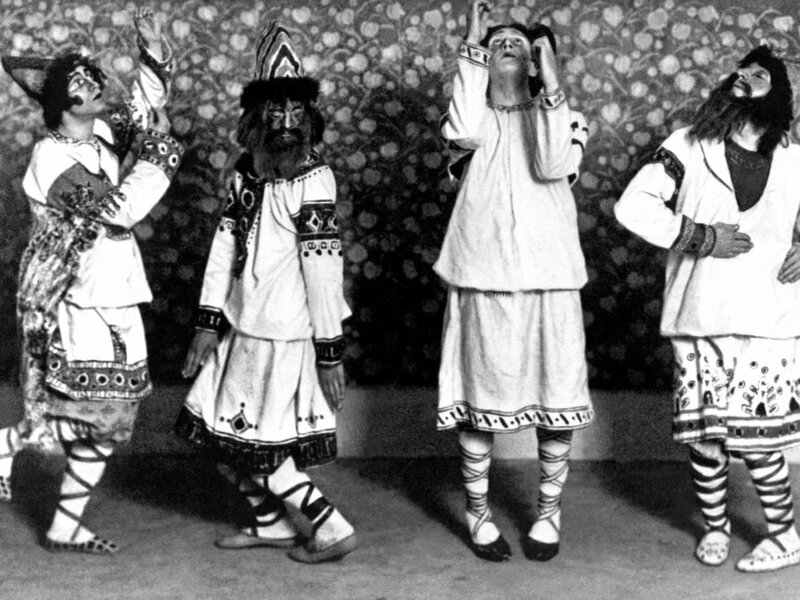 As a further riposte to the haka, even I can’t quite imagine the Daoist “Steps of Yu” (Yubu 禹步), but how about the Sacrificial dance of The Rite of Spring, complete with Roerich’s costumes and Nijinsky’s choreography? That really might take the lead out of the All Black pencil. This entry was posted in China, drôlerie, elsewhere, gender, language, other, ritual, WAM and tagged dance, heritage, sport. Bookmark the permalink.